General Motors has talked up its 4G LTE plans for the past year. This week, we found out just what they will cost, as GM unveiled pricing and features for its OnStar services, including 4G. 4G LTE connectivity will launch first with the 2015 Chevy Malibu in June, arriving on more than 30 GM, Buick, GMC, and Cadillac models by the end of the year. And you won’t have to pay up for a luxury car to get the faster connectivity: OnStar 4G LTE equipment will come standard on everything from the economical Chevy Spark to luxurious Cadillacs. Although the 2015 Audi A3 is the first car to come equipped with 4G LTE, GM says it's the first company to have a broad rollout of the high-speed connectivity. “We want everyone to have access to the 4G LTE services on-the-go,” said Stuart Fowle, spokesman for Global Connected Customer and OnStar. There’s a reason fort that: GM has found that young drivers expect cars to be as technologically savvy as they are. Take this winter’s polar vortex, Fowle says. Around 20,000 GM car owners were using the OnStar RemoteLink app start feature, every hour. The most popular model for remote starting was the youth-oriented Chevy Cruze. 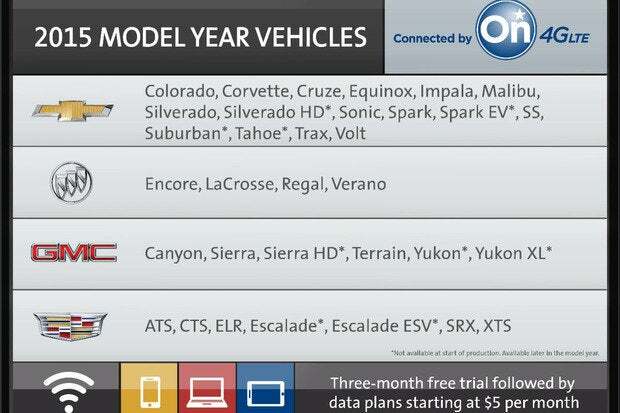 4G LTE connectivity is coming to these Chevy, Buick, GMC, and Cadillac models by the end of 2014. Pricing starts at $5 per month for 200MB of 4G LTE for OnStar subscribers. New car owners with OnStar 4G LTE hardware get a free trial of 4G LTE service for three months or 3GB of data use, whichever comes first. The 4G LTE service will include Wi-Fi hotspots for up to seven devices, with improved 4G LTE connectivity from an antenna which GM touts as stronger than your typical smartphone antenna. The range of the built-in Wi-Fi hotspot extends beyond the car: Assuming 4G service is available where you are, you could use the Wi-Fi from your Chevy Malibu at the beach with the kids, tailgating at the back of the Silverado truck, or sitting at an outdoor coffee house near a GMC Terrain. You don’t necessarily have to be inside your car to take advantage of the 4G LTE connectivity available through OnStar. Pricing depends on whether you subscribe to OnStar’s advisor-based service for the first 3GB of data. After that, pricing is the same for subscribers and nonsubscribers alike. One-day use by anyone (OnStar subscriber or not) costs $5 a day for 250MB. 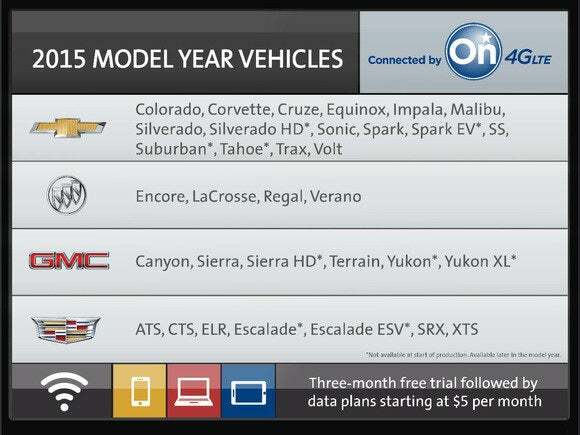 A 12 month, 10GB “bucket” of 4G LTE service will cost $150 for OnStar subscribers or $200 for nonsubscribers. Existing AT&T customers can add GM vehicles to their Mobile Share plan for $10 a month. As an added bonus, OnStar data plan subscribers will get family-friendly content, including a year of Famigo, which offers educational apps with parental controls, and a free 30-day trial of TumblebooksTV, a library of read-along video-animation storybooks aimed at young kids. GM has been gearing up 4G LTE for a while. At Mobile World Congress in 2013, the company announced it would offer 4G LTE connectivity on most 2015 models. At CES 2014, it outlined plans to add 4G LTE connectivity to most Chevrolet models. The car maker also says that most 2015 Buick models will come with 4G LTE connectivity. On Tuesday, GM also announced that most new 2015 Buick, GMC and Cadillac vehicles with OnStar hardware will also come with five years of the new OnStar Basic Plan and six months of an OnStar Directions & Connections plan. The Basic plan includes RemoteLink Key Fob Services to start an engine, turn on lights or honk the car’s horn from a smartphone app; OnStar vehicle diagnostics, and maintenance notifications. This story, "GM announces pricing for its 4G LTE service, to debut in 2015 Chevrolet Malibu " was originally published by TechHive.